The global drugs of abuse testing market is driven by increasing consumption of illicit drugs. Growth of the market can also be attributed to high demand for drugs of abuse testing screening products from law enforcement agencies. Testing for drugs of abuse is done in-house or onsite in order to detect drugs in the human body (saliva, blood, sweat) which are banned by the government for human consumption. The testing can be done using various technologies that involve rapid testing devices as well as analyzers which are laboratory instruments. Increasing demand for illicit drugs and increasing prevalence of drug addicts are driving the growth of the drugs of abuse testing market globally. The global drugs of abuse testing market can be segmented based on product, sample type, testing type, end-user, and region. In terms of product, the global market can be classified into analyzers, rapid testing devices, and consumables. The consumables segment accounted for a major share of the global market in terms of revenue in 2017. The segment is projected to expand at a significant CAGR during the forecast period as consumables are used in every application for taking the sample. Consumables include fluid collection devices and other reagents used in performing a laboratory test. Rapid testing devices are convenient for carrying out the preliminary test for detection of drug in the human body owing to the portability of the devices. The test conducted using rapid testing devices usually denote positive or negative results. If further detailed investigation if required, then testing is done in laboratories using analyzers. Based on sample type, the global drugs of abuse testing market can be segmented into saliva, blood, sweat & hair, urine, and breath. The urine segment accounted for a major share of 44% of the global drugs of abuse testing sample type segment in 2017, followed by the saliva segment with 24% market share. In terms of testing type, the global drugs of abuse market can be categorized into pain management testing, criminal justice testing, and work place screening. The criminal justice testing segment constituted 39% share of the global drugs of abuse testing market by test type in 2017. Based on end-user, the global drugs of abuse testing market can be bifurcated into forensic laboratories, diagnostic laboratories, on-the-spot testing, and forensic laboratories. In terms of region, the global drugs of abuse testing market can be segmented into North America, Europe, Asia Pacific, Latin America, and Middle East & Africa. North America dominated the global market and can be projected to gain market share by the end of 2026. The drugs of abuse testing market in North America is driven by high demand for rapid testing devices in the region, as the government is regularizing the rules and regulations for illicit drugs consumption. The drugs of abuse testing market in Europe is expected to grow significantly during the forecast period due to increasing incidence of abuse of prescription drugs in the region. North America is a highly attractive market and expected to increase at a significant CAGR during the forecast period due to rise in law enforcement for illicit drugs interdiction. Major players operating in the global drugs of abuse testing market include Alere, Inc., Laboratory Corporation of America Holdings, Roche Diagnostics, Thermo Fisher Scientific Inc., Drägerwerk AG & Co. KGaA, Siemens Healthineers, Express Diagnostics International Inc. and Shimadzu Corporation. These companies have adopted the strategy of acquisition and collaboration in order to strengthen their position in the global market. This report analyzes the current and future scenario of the global drugs of abuse testing market. Increase in impact of drug and alcohol abuse on public health, rise in demand for drug abuse testing among private employers, and surge in abuse of prescription drugs are projected to be major drivers of the global market during the forecast period. The global drugs of abuse testing market report comprises an elaborate executive summary, which includes a snapshot that provides information about various segments of the market. It also provides information and data analysis of the global market with respect to the segments based on product type, sample type, testing type, end-user, and region. A detailed qualitative analysis of drivers and restraints of the market, and opportunities has been provided in the overview section. Additionally, the section comprises competitive matrix and company profiles along with business overview to understand the competitive landscape in the market. This section of the report also provides market attractiveness analysis by region and market share analysis by key players, thereby presenting a thorough analysis of the overall competitive scenario in the global drugs of abuse testing market. Based on product type, the global drugs of abuse testing market has been segmented into analyzers, rapid testing devices, and consumables. The analyzers segment has been divided into immunoassay analyzers, chromatographic devices, and breath analyzers. The rapid testing devices segment has been bifurcated into urine testing devices and oral fluid testing devices. The consumables segment has been classified into fluid collection devices and others. In terms of sample type, the global market has been categorized into saliva, breath, urine, blood, and hair & sweat. Based on testing type, the global drugs of abuse testing market has been divided into pain management testing, criminal justice testing, and workplace screening. In terms of end-user, the global market has been categorized into hospitals, diagnostics laboratories, on-the-spot testing, and forensic laboratories. In terms of region, the global drugs of abuse testing market has been segmented into North America (U.S. and Canada), Europe (U.K., Germany, France, Spain, Italy, and Rest of Europe), Asia Pacific (India, China, Japan, Australia & New Zealand, and Rest of Asia Pacific), Latin America (Brazil, Mexico, and Rest of Latin America), and Middle East & Africa (South Africa, GCC Countries, and Rest of Middle East & Africa). The market size and forecast for each of these regions and the mentioned countries/sub-regions have been provided for the period from 2016 to 2026, along with their respective CAGRs for the forecast period from 2018 to 2026, considering 2017 as the base year. The research study also covers the competitive scenario in these regions. The report profiles major players in the global drugs of abuse testing market based on various attributes such as company overview, financial overview, product portfolio, business strategies, and recent developments. 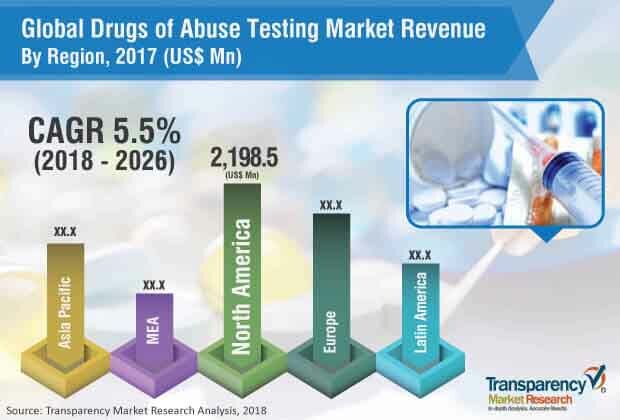 Key players operating in the global drugs of abuse testing market are Alere, Inc., Laboratory Corporation of America Holdings, F. Hoffmann-La Roche AG, Thermo Fisher Scientific, Inc., Drägerwerk AG & Co. KGaA, Siemens Healthcare, Express Diagnostics International Inc., and Shimadzu Corporation.